Because of its Ancient History, RTcmix was developed initially as a command-line program. What does this mean for you? To use RTcmix as a standalone music creation application, you will need to edit a text file (called a scorefile) filled with command directives for RTcmix. You will then need to send this scorefile into RTcmix where it can be properly parsed and executed. If you are using RTcmix as part of another application (such as the Max/MSP rtcmix~ object) with internal buffers for RTcmix scripts, you don't even have to do this scorefile business -- just do what the application documents say to do an RTcmix will work as if by magic!. Of course, this makes several basic assumptions -- we are assuming that you are "in" the same directory where the file "greatmusic.score" is stored, and we are also assuming that the RTcmix CMIX command has been installed and that your command path has been set properly (please see the Command Line RTcmix page for directions on how to do this, or consult a good Unix tutorial for information about directories, command search paths, etc.). Be sure that the "greatmusic.sco" file is a text-only file, any extraneous formatting commands used by Word (for .doc files) or other document editors will be thoroughly confusing to RTcmix. Once the CMIX application parses and executes the commands in your "greatmusic.score" scorefile, you should hear the ASTOUNDING SOUNDS that you have specified by the particular directives you have entered into the scorefile. Notice that every RTcmix scorefile command looks like a function in many standard computer-programming langauges. The syntax consists of a command name followed by a set of parameters (in parentheses) for the command. In RTcmix scorefiles, the parameters can be specified as integers (no decimal point) or as floating-point numbers (yes, with a decimal point) -- it doesn't make a difference. What's even more fun, you can also substitute variables, additional functions, or expressions for any parameter in an RTcmix scorefile command. Some RTcmix scorefile commands require literal or string arguments, specified in "quotation_marks". We cover these features in more detail below. tells RTcmix that we will be using the WAVETABLE digital synthesis instrument. RTcmix has a fairly rich set of pre-made instruments for use in scorefiles, and you can easily create your own instrument designs. Once you load an instrument using the load command, it is available for use throughout the score; you don't have to reload it again. Finally, we get to the WAVETABLE command itself. After setting up the two function-tables, the parameters for WAVETABLE are very simple. but this would have two consequences for our "greatmusic.sco" sound. The first is that it would default to a value of 0, which means all of the sound in our 2-channel output would come only through channel 0. The second is that we need to specify parameter 5 in order to use the waveform table-handle variable in parameter 6 to reference the waveform we want WAVETABLE to use. The reason this final parameter is also optional is to allow WAVETABLE to employ an older method for specifying waveforms using the makegen command instead of maketable. Again, see the earlier documentation for a discussion of how this approach works. Many RTcmix instruments have optional parameters like this, sometimes required when other p-fields have certain values, often optional for use at your discretion. Some final comments about this simple scorefile -- you may be wondering where the heck we came up with an amplitude specification of 20000. RTcmix generally treats amplitude in two ways. The method used by instruments doing direct synthesis of sound (like WAVETABLE) is to work on a 16-bit (CD-quality, integer) scale. This means that the absolute amplitude allowed by all combined RTcmix notes is 32768. Any sample-value higher than this will generate distortion, probably something you don't want to hear in your ASTOUNDING SOUNDS. Much lower than 5000 or 10000 will probably be difficult to hear, so we chose 20000 is a good starting-point for our scorefile. Often it is a matter of trial and error to find the right amplitude for the best qualty sound. If you prefer, you can direct RTcmix to write a floating-point soundfile, which you will need to convert (and 'rescale') later to a 16-bit format for auditioning. This allows you to use an amplitude scale of your choice, and you will probably not need to be concerned about distortion from exceeding an upper-limit (the upper numerical limit for floating-point numbers is quite large on current machines). You will need to consult the documentation for the rtoutput scorefile command to do this. Reading the WAVETABLE documentation, you may notice that it mentions that the frequency or pitch of the note may be specified in Hz (cycles per second) or in something called oct.pc notation. oct.pc is a way to use standard "western" keyboard notes without having to look up the pitch-frequency conversion. It works by arbitrarily assigning the octave of middle-C to 8.00. Any semitone above middle-C is added as a "hundredth" to the left of the decimal point, i.e. 8.01 is the C# just above middle-C, 8.02 is the D, 8.03 is the D# (Eb), etc. up to 8.12, which is equivalent to 9.00. 9.01 is then the C# one octave and a semitone abouve midddle-C.
Also in the WAVETABLE documentation, you will note that the parameters are referred to as "p-fields", and that the numbering of parameters starts at 0. So the start-time parameter for WAVETABLE is given as "p0", and the duration as "p1", amplitude as "p2"... RTcmix instruments are not limited in how they use (or how many they use) p-fields, although for synthesis instruments p0 is usually the start time, and p1 is the duration. For signal-processing instruments, p0 is the output start time, p1 is usually the input start time, and p2 is the duration. Most of this scorefile is similar to the simple WAVETABLE scorefile above, with a few obvious and more subtle differences. The rtinput and rtoutput commands are new, and relatively simple to understand. Although in the example above we are processing an existing soundfile, the documentation page for rtinput describes how to set up for real-time audio input to enable live signal processing. [note: this will cause the "input skip" parameter to be ignored in RTcmix instruments.] In our example, we are going to process the soundfile "/snd/somesoundfile.aiff". The presence of the rtoutput command will instruct RTcmix to write a soundfile (in this case an aiff file -- RTcmix will use the suffix of the filename by default to determine the type of soundfile. This can be changed and the data format set "by hand" with optional parameters for rtoutput). At the end of the CMIX execution of the scorefile, the soundfile "/snd/amsound.aiff" will exist with the processed sound in it. RTcmix will play the output sound as it is created, unless the set_option command is used to turn the RTcmix audio output off. rtoutput will also check to see if the file already exists -- if it does it will terminate the application and not overwrite the file. This behavior can also be changed using the set_option command. by the AM commands needs a little explanation. The duration for the AM notes are 4.34, 4.34 and 21 seconds respectively. But the use of the "line" specifier for the maketable command, which 'draws' an envelope using [time, value] parameters (reading from the above command parameters: at time 0 be at value 0; at time 1 be at value 1; at time 9 be at value 1; at time 10 be at value 0), suggests that the duration of the note should be 10 seconds long. RTcmix will 'stretch' or 'compress' the data for an amplitude envelope (as well as many other note-length envelopes) to fit the duration of each individual note. 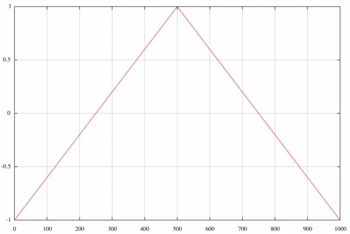 Basically, we have specified an amplitude envelope with a 10% fade-up and a 10% fade-down, no matter what the duration. If you want to have very precise amplitude points on your amplitude envelope, then just be sure that the duration of the note you are generating matches the duration of the [time, value] pairs on your amplitude maketable command. will do this -- all of the values of the maketable envelope represented by the ampenv variable will be multiplied by 0.2. 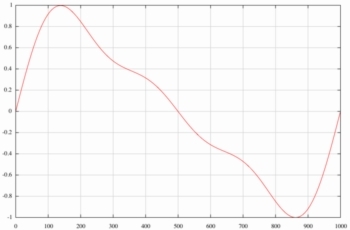 So instead of going from 0.0 to 1.0, the control envelope will fade up to 0.2 and then back down to 0.0. Doing this envelope multiplication is very common for synthesis instruments where amplitudes usually need to be specified on a 0-32768 scale. There are also other ways to determine the amplitude in a maketable control signal (check the optional "nonorm" specifier for the command). which will be the second sonic event entrance, will draw upon the harmonically-complex modulation waveform. There are other subtleties in using the pfield-handle and table-handle variables (such as ampenv and amwave above). Please see the Short Tour of PField Capabilities document for more detailed information. *** WARNING:  No bus_config defined, setting default (in/out). This output should be fairly self-explanatory. The main thing to realize is that the p-field (parameters) that are printed in the listing are the actual numeric values that are passed into RTcmix (or starting and ending values in the case of pfield-handles or table-handles). Any variables, mathematical operations or functions that are employed in the scorefile will display their calculated value in this listing. The total peak amplitude for the output channel(s) is also printed. This listing is very useful when debugging a score. If you are totally annoyed by this, you can turn off the output printing (or turn it back on again) using the print_off or print_on scorefile commands, or set the global print option in the set_option command. will guarantee smooth amplitude transitions in our notes. Updating will happen once every sample. The default is to update 1000 times/second, which is normally fine unless you have very fast control changes occuring. Our WAVETABLE notes in the score are 0.5 seconds long, and since we are taking advantage of the 'stretching' and 'compressing' feature of the amplitude function-table slot, we will have fade-up and fade-down times in the hundreths of a second -- a 1000 times/second update may not be enough. Why not always update at 44100/second? Most of the time this fine-grained updating is not necessary, and it significantly slows down the computation of notes. In real-time situations where many notes may be scheduled simlutaneously, a more efficient, faster-running instrument may be preferable. Realistically, slower update times (for example, resetting at 10000 times/second, reset(10000) are probably more than adequate for all but the finest-grained control envelope requirements. You can declare and type variables if you'd like, but it isn't needed for the language. Same for semicolons. Saving the above information in a scorefile and executing it with the CMIX command should schedule 36 overlapping, 0.5-second-long notes, each with a different timbre corresponding to the wave = maketable(...) command immediately preceding it in the 'unrolled' for-loop of the scorefile. Our intention is not to teach C-like programming in this tutorial, and in fact you may want to choose a different command interface such as the perl or python command-language versions of RTcmix, However, one more algorithmic scorefile example may help demonstrate a few additional features of the RTcmix command parser as well as show how small number of scorefile commands embedded in an algorthmic structure can yield relatively complex output. In this scorefile, we are storing pitch values (in oct.pc form) in a Minc array called pitches. We determine how many elements are stored in the array using the len command, storing that value in the variable plength. We will need this value to choose elements in the array. The first line uses the RTcmix scorefile command irand, to set pchindex to a random value between 0 and the number of elements in the pitches array -- this is why we needed the plength value The irand command returns a number between its two parameters, but irand will generate fractional values (i.e. 5.78914, or 7.00278). The trunc command will return only the integer part of these random fractions, which will give us an exact element in the pitches array. So pchindex now contains a random number that will allow us to retrieve a value from the pitches array. The second line does this, storing this retrieved value in the variable pitch. We are also using the random command to choose a stereo location for each of the 1000 notes we generate, using the optional p-field 7 in the START command. The rtsetparams command has an optional bufsize parameter that can affect the real-time performance of RTcmix. Usually the default will work fine, though. The rtinput and rtoutput commands set the ability to read from real-time (mic/line) inputs or soundfiles (depending on the settings established using the set_option command), and to set the data type and format of soundfiles. The set_option command also allows you to control a number of other RTcmix features (such as turning the audio on or off, checking and reporting amplitude peaks, etc.). will generate a 3.5-second long sound via WAVETABLE, and then amplitude modulate this sound before playing it or writing a soundfile. Given that these bus_config chains can contain fairly sophisticated signal-processing instruments, this can be used to create complex audio outputs. This feature is especially useful when RTcmix us used in an embedded context (RTcmix "inside" another application). You can read an early description/tutorial about the bus_config command written by John Gibson and Dave Topper by clicking here. The new PField commands such as maketable, makeLFO, makerandom, makefilter and makeconnection represents a powerful control mechanism for RTcmix instruments. The Short Tour of PField Capabilities discusses a few of the capabilities of pfield-handles and table-handles. The sample scorefiles in the "RTcmix/docs/sample_scos" directory are also a good source of examples for using RTcmix instruments. Many of them are even wonderful little patches of music -- we hope you enjoy them all!